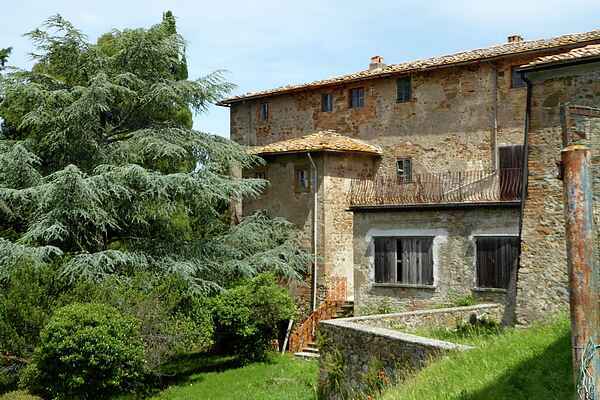 The Scornello farmhouse complex is set in typical sloping Tuscan landscape. It is near the beautiful City of Volterra. The complex consists of a villa and a small hamlet with 4 attached apartments. The guests can enjoy the communal garden, swimming pool and barbecue. There are delightful views of Volterra from the hamlet. The city dominates the landscape. The apartments are at the end of a 4 km sandy path. The final part is a lane lined with centuries old cypress trees. The furnishing is typically Tuscan. It is rustic and cosy with tiles and wooden beams. The farmhouse complex is in grounds of 340 hectares. The grounds contain wheat fields, meadows, woods and olive trees. The location is quiet, almost isolated and therefore excellent for walking, cycling and sheer relaxation. Volterra, San Gimignano and Siena are highly recommended for enjoyable day trips.